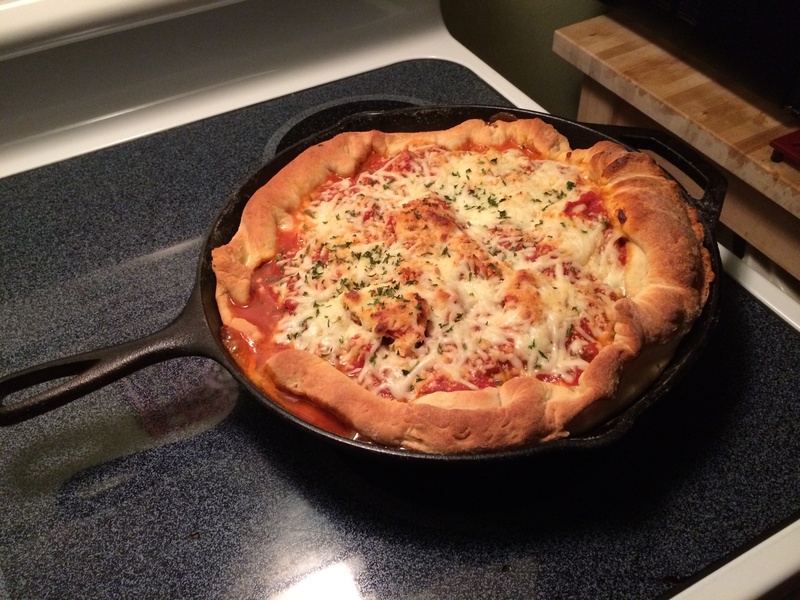 As I promised, the deep dish pizza is complete. It was as easy as they showed on TV. I picked up some pizza dough from the local pizzeria. Your local pizza parlor is happy to sell pizza dough and it’s so convenient especially for a weeknight meal. I chose to use chicken that I seasoned with a blackened seasoning and grilled off on my indoor grill pan. I sliced the chicken on the bias and set aside until I was ready. Then I sauteed some peppers, onions, and a little garlic in another pan. I used a splash a balsamic vinegar and a tablespoon of sugar, and of course, kosher salt and pepper to bring out the flavors of the veggies. In another bowl, I blended together some Ricotta, mozzarella, and grated Parmesan with a little fresh chopped Italian flat leaf parsley. I bought my favorite Marinara sauce for this dish, I didn’t need to do any extra work. I liberally oiled the cast iron skillet and placed it in a 400-degree oven until it was super hot. Brought the skillet out of the oven, set my dough in the bottom but let the sides hang over. I started by ladling the sauce first then layering all the ingredients, finishing with more sauce and finally topped with more mozzarella and Parmesan. I drizzled olive oil on the crust that I tucked in around all the edges. Transferred the skillet back in the 400-degree oven for another 30 minutes. Oh WOW!, does it look good? Let the pizza rest for 15 minutes allowing it to set, then cut and serve.